Text Me presented artworks on the theme of messaging. Curator, Glenn Walls, assembled a group that included him, four artists who regularly work with text – Rose Nolan, Sanné Mestrom, Gabrielle de Vietri and Danielle Freakley – together with the design duo Pandarosa. The works incorporated the motif of text, or oblique references to it, across various technologies of expression not restricted to the typographic form. Although the artists showed an awareness of the history of concrete poetry, conceptual art and particularly the Art & Language movement, they avoided rehashing any of the old concerns of structural linguistics about the systematic features inherent in language’s operation. The exhibition did not focus on the structures of language per se but its instrumentality in building relationships or communities. By foregrounding the social functions of language and privileging individual utterances, the exhibition closely examined various intimacies created by speech and writing. Certain of the artists achieved this by inserting themselves into the work, or by using first-person to second-person speech, as if to whisper to the viewer, this is about you and me. Others created this intimacy by expressing personal vulnerability. These various strategies seemed to run the spectrum bounded by the two extremes of what the imperative Text me can signify: on the one hand a breezy sign off meaning let’s talk and on the other a neediness of the you never write, you never call…variety. Sanné Mestrom has become known for large-scale painted wall texts of quasi biblical messages rendered with dizzying spatial illusions. By contrast, in Text Me she presented a series of large black and white images that were so degraded they appeared to be copies of copies. They depicted a performance by the artist that involved smearing her painted body along a wall. 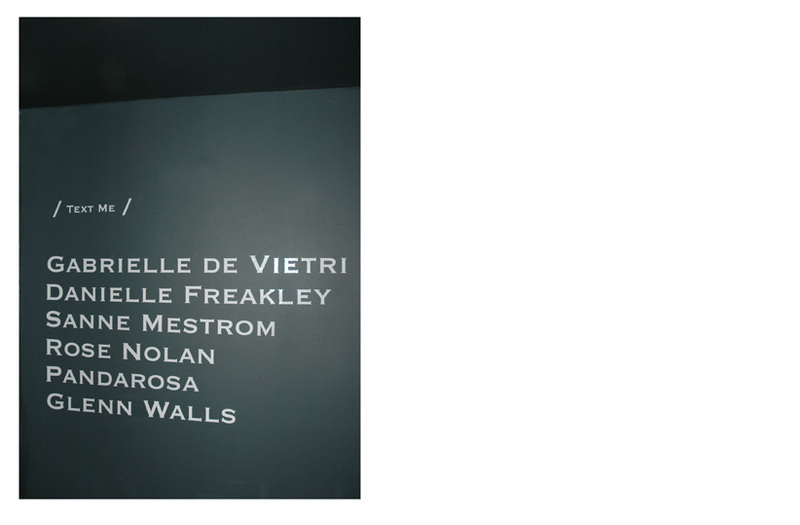 There was no typographic text in this work; instead Mestrom presented the evidence of using her body as a writing instrument to create what could be seen to function like a kind of graffiti tag, based on the body leaving behind its own indexical signature on the wall. However, the immediacy of effect it sought to create was undone by presenting the documentation of the work rather than either performing the work or exhibiting the smeared wall. 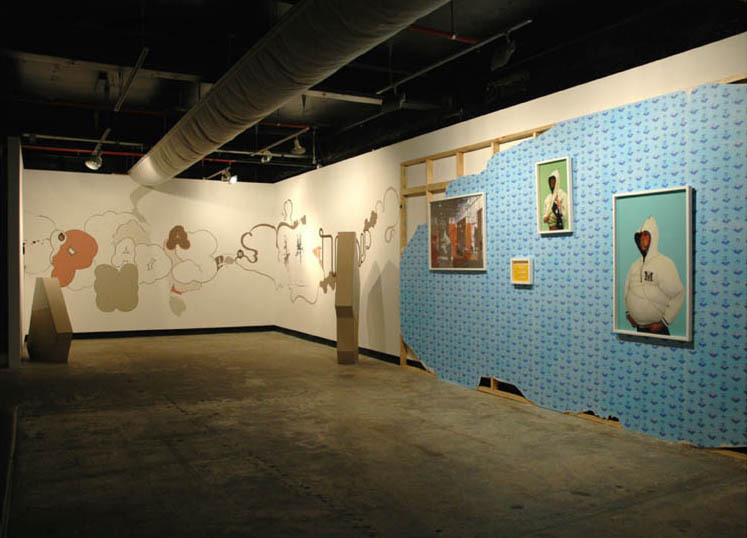 Pandarosa presented a wall-painting framed by two freestanding cardboard forms painted with ink drawings of each of the two members of the collective. 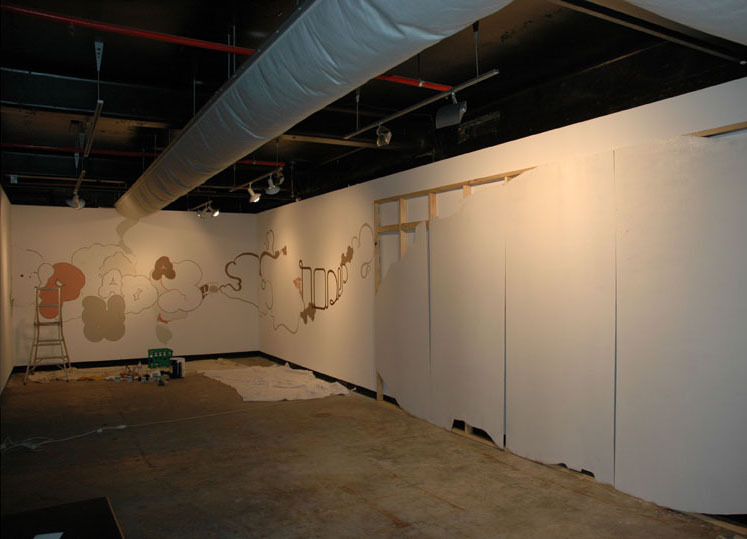 The painted wall featured their signature style of silhouette shapes overlaid with organic-looking spidery drawing. It appeared to spell out Pandarosa. It too functioned as a graffiti tag, but in a more literal way than did Mestrom’s work. The work’s main content was a representation of its own authors who signed it thrice over: once by creating it in their signature style, a second time by writing their name large within it and a third time by presenting images of each of the two of them framing the work like bookends. As we might expect from graphic designers, there was an overt concern with the way text’s typographical features mediate its signification. But in this instance, the duo achieved a kind of anti-typography for there as a partial breakdown of legibility in the individual letters and their sequencing. 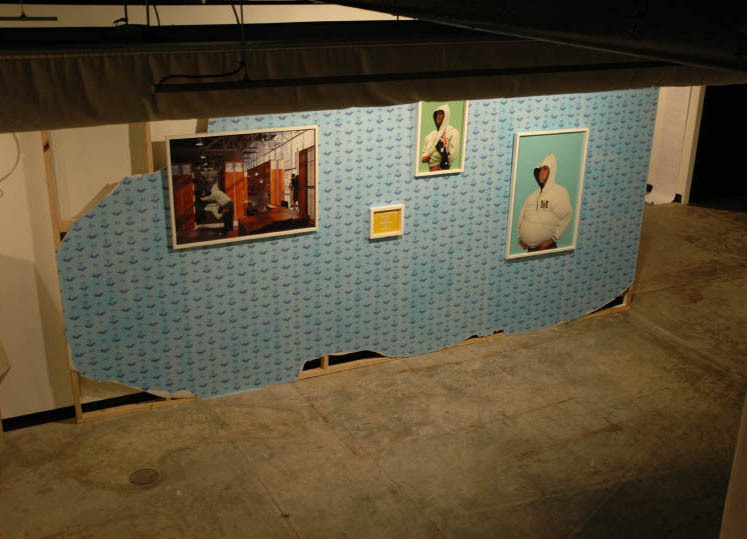 Glenn Walls presented an installation that featured a crumbling wall supporting a puzzling assortment of images. These functioned like conceptual clues needing interpretation. This work was also a kind of graffiti tag, or signature writ large, but a very subtle one. By exhibiting a wall, the artist invoked his own surname, Walls, in the form of a rebus. The wall was papered with a repeated pattern of symbols reminiscent of a personal coat-of-arms based on an assortment of mementi mori: including a modernist building, a retro car, three skulls and an urn. An image of the artist appeared separately in each of the framed photographs displayed on the wall, but in them he was not really himself. Instead he functioned as a kind of blank person on which to hang messages and monograms. The entire effect was to generate a slippage between logos, the plural of logo (or logotype), and logos, the word. This wall appeared to simultaneously break down and reconstitute itself; through its self-referential play, it absorbed the signature, transformed and diffused it……….